INDUSTRY.co.id - England - Eventually Prince Harry and Meghan Markle officially become a married couple. The summit of the Royal Wedding of England was well done. Both had pronounced the sacred vows in the chapel of St. George (19/5) Windsor with the blessing of Archbishop Justin Welby. Quoted from People, On the day of her marriage Harry dressed in a British knight suit looks happy mixed nervous blush adorn Harry's face. 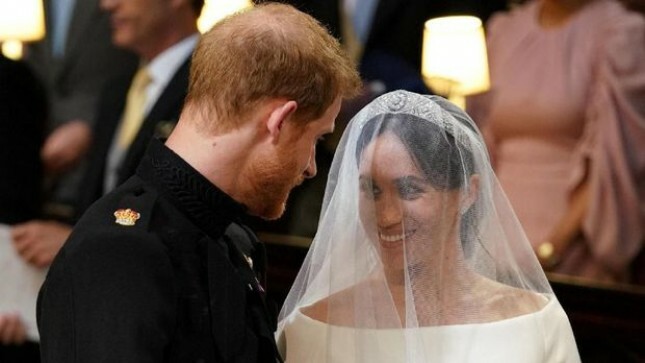 Meghan Markle looks beautiful on her wedding day with natural makeup. Meghan came wearing a graceful and simple Clare Waight wedding dress from the Givenchy fashion house. Meghan appears to be accompanied by her father-in-law Prince Charles to the altar. The wedding ceremonies of Prince Harry and Meghan Markle take place solemnly. Members of the palace family and invited guests appeared at the wedding ceremony of the wedding. "I give you this ring as a sign of our marriage, I surrender myself completely to you, everything I have I submit to you with love for God," said Harry and Meghan in turn. "In the presence of God and everyone present here, Harry and Meghan have given their approval and promised their marriage, they have declared marriage hand in hand, giving and receiving the ring, so I declare them husband and wife," Welby said. With the marriage ceremonies of Prince Harry and Meghan Markle, both are now officially awarded the Royal Highness Duchess and Duke of Sussex.